Girl Scouts Obtain Restraining Order Against Trump writes New Yorker satirist Andy Borowitz. WASHINGTON (The Borowitz Report)—In an extraordinary rebuke of the President of the United States, the Girl Scouts of the U.S.A. have obtained a restraining order against Donald J. Trump. Scriber congratulates the GSUSA for their foresight and proactive action. Undoubtedly their restraining order was in reaction to Trump’s speech at the Boy Scouts Of America National Jamboree. 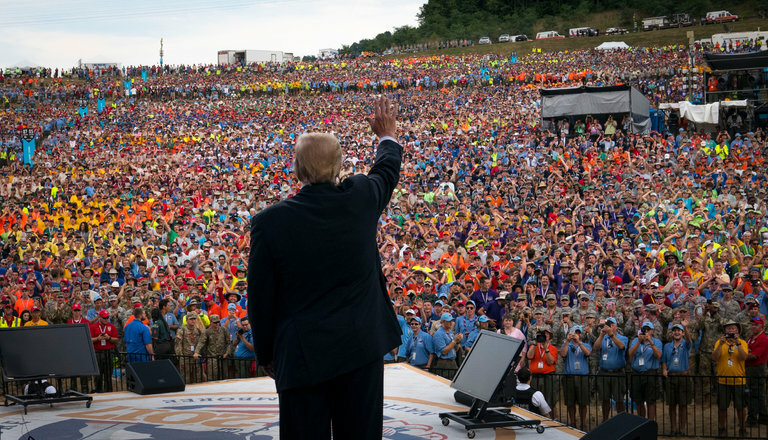 The NY Times covers that speech in After Trump Injects Politics Into Speech, Boy Scouts Face Blowback. The quadrennial event … attracts tens of thousands of people, and very often, presidents, who usually speak about service, values and citizenship. But Mr. Trump used the speech to rail against “fake news” and recount his election victory. Scriber’s Usually Unreliable Sources report that, in a rare display of empathy for the difficulties his speech caused the Boy Scouts, Trump ordered his Secretary of Education, Betsy DeVos, to prepare a 10-question multiple choice test covering the main points of his speech. Those Sources say that Trump plans to personally administer the test after his reelection at the next quadrennial jamboree.